The many benefits of trees are science-based and backed by research. Eureka! 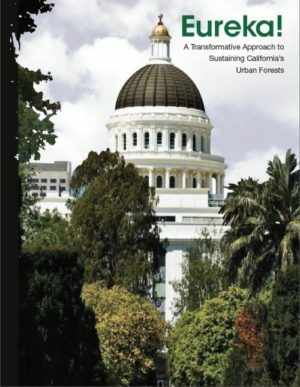 A Transformative Approach to Sustaining California’s Urban Forests (Full Report & Executive Summary) A report released by California ReLeaf in April 2014 which looks closely at viable funding options for urban forestry and how to ensure no net loss of urban tree canopies, despite continual growth and development in California. California Climate Action for Health: Integrating Public Health into Climate Action Planning A February 2012 report from the California Department of Public Health which provides an overview of climate change as an important health issue and reviews how many strategies for reducing greenhouse gas emissions can also improve the health of a community. Pages 25-27 of the report highlight the role of urban greening in climate action planning. Environmental Scan of Urban Forest Opportunities in California Conservation Strategy Group (CSG) assisted California ReLeaf in the Environmental Scan of Urban Forest Opportunities in California project, funded by a grant from the California Department of Forestry and Fire Protection. Report completed May 2011. Green Cities: Good Health, from the University of Washington, provides a wealth of scientific evidence that supports efforts to better plan, implement, and manage nature in cities. This site contains research findings on a variety of themes including livable cities, community building, local economics, place attachment and meaning, crime and fear, safe streets, active living, reduced risk, wellness and physiology, healing and therapy, mental health and function, working and learning, and lifecycle and gender. Human Dimensions of Urban Forestry and Urban Greening features research at the University of Washington on people’s perceptions and behaviors regarding nature in cities. The site addresses the following topics: nature and consumer environments, trees and transportation, civic ecology, and policy and planning. Materials include fact sheets, professional publications, and scientific articles. Landscape and Human Health Laboratory at the University of Illinois at Urbana-Champaign is a multidisciplinary research laboratory dedicated to studying the connection between greenery and human health. This web site contains multiple reports about the impacts of natural features—trees, grass, flowers, and green spaces—on public health issues such as safety, crime, violence, and aggression; strength of community; well-being, coping, and vitality; attention, executive-functions, self-control, and learning. Northern California Coast Community Tree Guide An April 2010 report from the Center for Urban Forest Research that weights the benefits of trees against the costs of trees in the Northern California Coast region. Planning the Urban Forest: Ecology, Economy and Community Development A 2009 report from the American Planning Association in collaboration with the USDA Forest Service, American Forests, and the International Society of Arboriculture. U.S. Forest Service Pacific Southwest Research Station. The Pacific Southwest Research Station is part of the USDA Forest Service Research and Design program, and conducts ecological and social science research to understand ecosystems, how humans influence those systems, and how to manage for sustained and enhanced benefits. Research program areas include Conservation of Biodiversity, Ecosystem Function and Health, Fire and Fuels, and Urban Ecosystems & Social Dynamics.